Solid and Striped "The Nadine" in seersucker with ruffle trim. For in-store inquiries, use sku #2459529. 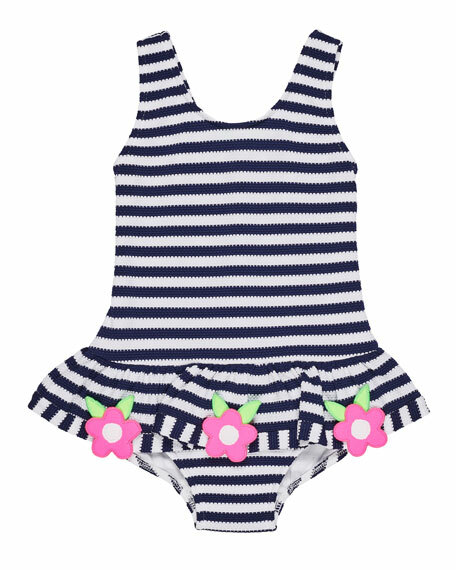 Florence Eiseman bathing suit in striped waffle knit, embellished with applied flowers. Scoop neckline. Ruffled peplum. Back keyhole. Nylon/spandex. Imported. JETS by Jessika Allen "Disposition" one-piece swimsuit in striped microfiber. V neckline; underwire support. Triangle cups with darts. Thin shoulder straps. Moderate seat coverage. Nylon/spandex. Imported. JETS by Jessika Allen one-piece swimsuit in solid microfiber. Striped mesh at waist. Sweetheart neckline. Darted cups for uplift. Halter strings tie behind neck. Hooks at mid back. Full seat coverage. Nylon/spandex. Imported.